To accompany the continuing surge in visitor numbers experienced by Western Australia’s iconic Rottnest Island, an exciting new resort opened on Rottnest this month. The first major new development on Rottnest for approximately 30 years, the Discovery – Rottnest Island resort is a $25 million joint venture between Baileys Group and Discovery Parks. Located in one of the Island’s most beautiful locations amidst the dunes beneath the iconic Bathurst lighthouse, Discovery – Rottnest Island offers an entirely new experience for visitors, while complementing the range of other more familiar and well-established offerings. 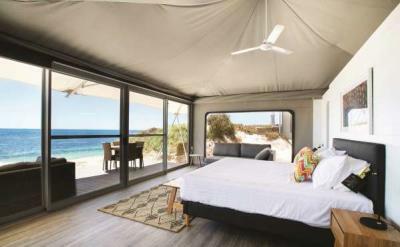 Discovery – Rottnest Island consists of 83 eco-tents, each with ensuites, connected via paths and elevated walkways and linked to the Pinky&apos;s Beach Club complex complete with swimming pool, alfresco bar and licensed dining areas. The Discovery – Rottnest Island development is widely seen as a strong expression of confidence in the future of the Island as a major visitor destination. Annual visitor numbers recently topped 770,000, which represents an increase of more than 15% on the previous year.